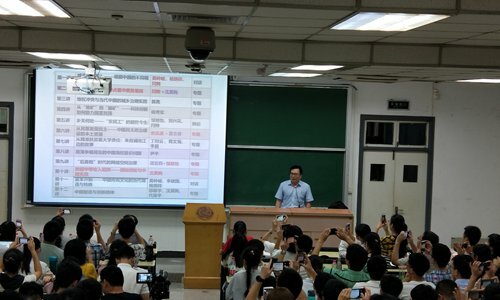 When a group of engineering students voted on a teacher to deliver their last class before graduation, to everyone's surprise, a political education lecturer was elected in a landslide. Yan Shuai is one of 13 lecturers for In-depth China, a popular public elective political course from the School of Marxism of Huazhong University of Science and Technology (HUST) in Wuhan in Central China's Hubei Province. The class soon became the most popular course at the university after it was first offered in March 2018. "We have seen 1,600 students sign up for 200 seats," Yan told the Global Times. Chinese college students have long been bored by the traditional way of teaching political classes. "Many knowledge points are introduced in a page or even a sentence in the book, but it's hard to clarify the relationship between these points and current affairs in a sentence or two," Yan told the Global Times. "I found that students are very interested in what is happening in China, but they are bothered by the lack of a systematic and professional introduction to these events," said Yan. What did the class do to attract so many students? Many topics are discussed in the In-depth China class. In response to a question related to human rights, Yan illustrated his answer through a story about a bachelor who asked the local government to find him a wife. A bachelor blamed the government for his single status, because the government failed to vitalize the local economy, and young women had no choice but to work in big cities. 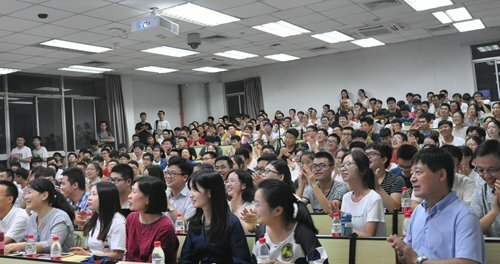 "The logic of the bachelor is hilarious, but the local government eventually helped him to develop his own career and solve his life and marital problems," Yan said in the class. "The case shows that the Chinese government has its own way of helping people live better lives, which is different from what US authorities usually do, but we do solve problems," Yan said. At least three teachers from different disciplines were invited to every class to help teach the class through a debate. "Many questions have more than one answer, and different perspectives may lead to different conclusions," Yan explained to the Global Times. "We hope lecturers from different disciplines can provide new insights to students from the perspective of their own expertise, and students can learn new methodologies to solve problems in the future." "It (In-depth China) opens a window for us, and inspires us to think about and pay attention to various hot social issues," said Ma Fuwei, a junior at the School of Electronic Information and Communications of HUST. "Actually, engineering students are interested in State affairs and the development status quo of our country, because they are closely related to us and our families," said Li Jiangshuai, a senior at HUST. In order to give students a vivid vision of China's current affairs, the class also invited reporters, government officials, organizers of poverty-alleviation programs and villagers to participate. Yan told the Global Times that a survey was conducted before the start of the class to make In-depth China more attractive to the younger generation. Some innovations were made to appeal to the college students of today. Internet and mobile teaching methods have been used in class to keep the attention of these "digital natives." Teachermate, a real-time class interaction platform and "Vdanmu," an application that allows students to send "bullet screens" during class, help students participate. "Bullet screen" or "danmu" in Chinese allows real-time comments from viewers to fly across the screen. "Students are allowed to use these tools up to three times and for less than 10 minutes each time in a class, which is fine," said Chen Xunwei, a teacher at HUST. The course also has a WeChat official account and a chat group. The account releases information about upcoming classes and publishes highlights from past classes, and the group allows students to ask questions at any time. Yan uses a mobile application to create a lottery system to call on students for questions. Bullet screens and online voting apps are also useful tools for Yan. At the end of the semester, students finish their class with a dissertation themed "I have a suggestion for my country." The class has received 400 dissertations and many positive reviews from the students. "I was surprised by the insightful opinions in these dissertations," said Huang Lingjun, dean of the School of Marxism of HUST. After attending a class on China's poverty alleviation, a student said, "Since I have been living in the city, I was confused about why China still calls itself a 'developing country.' After learning the importance of poverty alleviation, I know that our country is right and honest in finding its position, which inspires me to study harder and make an effort to achieve the Chinese dream."